First puck drops on the 26th season of Wichita Thunder hockey on Friday, Oct. 13, against the Indy Fuel at INTRUST Bank Arena. The franchise has been putting the biscuit in the basket since 1991, making the Wichita Thunder our city’s longest running professional sports team. Thunder hockey games are great fun for all ages, offering non-stop, family-friendly entertainment while watching up-and-coming professional hockey stars on the ice. Here’s a primer on Wichita’s hockey team. The pinnacle of professional ice hockey in North America is the National Hockey League (NHL). Like Major League Baseball, ice hockey has a system of farm teams to develop players. A tier below the NHL is the American Hockey League (AHL), a group of teams affiliated with specific NHL teams. One more level down is the ECHL, formerly known as the East Coast Hockey League, which also directly feeds players to specific AHL and NHL teams. This is the Thunder’s fourth season in the 27-team ECHL. They are affiliated with the NHL’s Edmonton Oilers and the AHL&apos;s Bakersfield Condors. "To be working with a storied franchise like the Edmonton Oilers brings a new level of energy to our club,” second-year Thunder head coach Malcolm Cameron said in a press release, adding that Edmonton was one of the most exciting teams in the NHL last season before finishing the season in the second round of the playoffs. The Oilers have won five Stanley Cups. Like the Oilers and the Condors, the Wichita Thunder have a rich history of winning. The team was an original member of the Central Hockey League when it formed in 1992 and spent 22 seasons there, winning back-to-back championships in 1994 and 1995 and advancing to back-to-back league finals in 2012 and 2013. This year Wichita will compete in the Mountain Division of the ECHL’s Western Conference, alongside the Allen Americans, Idaho Steelheads, Rapid City Rush, Tulsa Oilers, Utah Grizzlies and Colorado Eagles, last year’s ECHL champions. The team opens training camp in early October at the Wichita Ice Center, which houses the operations office. The Thunder’s regular season runs mid-October through early April, with 36 games this season on home ice at downtown’s INTRUST Bank Arena. Under the affiliation agreement, the Edmonton Oilers will designate players within their development system for assignment with the Thunder. The club will also be composed of players who are signed to AHL and ECHL contracts. The Thunder keeps an 18-player roster that includes a mix of returning players and new additions. In an average year, 75 percent of the players are Canadians. A scan of this year’s roster includes hometowns in provinces throughout Canada, a European country along with California, Minnesota and Michigan. Local brothers Brandon Steven, Johnny Steven and Rodney Steven – owners of Genesis Health Clubs and several car dealerships in the Wichita area – formed Steven Brothers Sports Management LLC and bought the Thunder in August 2011. In addition to the Thunder, the ownership group runs the Wichita Ice Center and recently added a junior hockey team – a semi-professional team designed to develop players between the ages of 16-20 who hope to play collegiately or professionally. 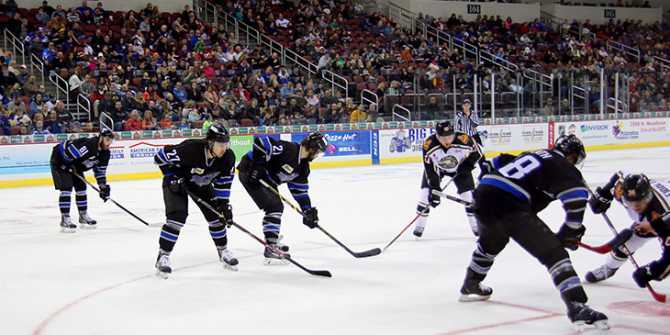 “Our goal from day one was to grow hockey and ice sports in Wichita and with an already rich hockey tradition in this city, we felt this was another way to bring our loyal fans a great product while trying to grow the sport to new heights,” Rodney Steven said in a press release announcing the Junior Thunder. “For a family of four to go to a Thunder game, it’ll cost you the same as going to a movie. But you’ll be interactive with each other and with fans around you, you’ll be entertained, you can be loud, you can get up on your feet. If you go to a movie, it’s already scripted. You never know how a hockey game is going to play out,” said Thunder General Manager Joel Lomurno, who has worked for the Thunder all but one of its 26 seasons. A Wichita Thunder hockey home game includes food and beverage options throughout the arena, a Thunder merchandise store, entertainment, activities and contests on the video screen or on the ice throughout the game. Oh, yes, the game – three 20-minute periods are played during a regulation hockey game, with 17-minute intermissions between the first and second periods. Twenty-eight of the team’s 36 home games fall on Friday, Saturday or Sunday. Games start at 7:05 p.m. Monday through Saturday and 4:05 p.m. on Sundays. Individual tickets range from $9 to $40, with discounts for youth, seniors and military. There are also season ticket and mini packages available. Games regularly draw between 5,000 to 6,000 fans, including more than 2,000 season ticket holders. In the past decade, Lomurno said, the fan demographics for the Thunder and hockey in general have shifted to include more families and more women. Crowds are now 50/50 women and men. Many dates have specific, one-time promotions, from character-themed nights to discount ticket nights to giveaway items. A new promotion scheduled this season is #ILOVEWICHITA Night on Saturday, Jan. 20 to celebrate the city’s 147th birthday. The team will be wearing special Wichita city flag-themed jerseys that night which will be auctioned off after the game. There will be special discounts to fans wearing items promoting city pride and the city flag. For the full Wichita Thunder schedule including promotions or more information on Thunder tickets, visit wichitathunder.com. The standard ice hockey rink is 200 feet long by 85 feet wide. The ice is approximately ¾-inch thick and is usually kept at 16 degrees Fahrenheit for the proper hardness. The thicker the sheet of ice becomes, the softer and slower it is. The rink is divided by a red line and has a goal on each end. A pair of blue lines extends across the ice 60 feet from each goal to break up the ice into attacking, neutral and defending zones. There are five face-off circles – where officials drop the puck between one player from each team to begin or resume play – and goal creases are the areas right in front of the goal that are off-limits to offensive players who do not have possession of the puck. A game consists of three 20-minute periods with 17-minute intermissions between the first and second periods. If the game is tied at the end of regulation, there is a 15-minute intermission followed by another 20-minute period. Each team has six players: a goalie, two defensemen and three forwards. Goaltender – his goal is to keep the puck out of his own net. Offensively, he may start his team down the ice with a pass, but seldom does he leave the net he guards. Defensemen – these players try to stop the incoming play at their own blue line. They try to break up passes, block shots, cover opposing forwards and clear the puck from in front of their own goal. Offensively, they get the puck to their forwards and follow the play into the attacking zone, positioning themselves just inside their opponent&apos;s blue line. Forwards – a center, a left wing and a right wing. The center is the quarterback on the ice, leading the attack by carrying the puck on offense. He exchanges passes with his wings to steer the play toward the opposing goal. On defense, he tries to disrupt a play before it gets on his team’s side of the ice. The wings work with the center to set up shots on goal and defensively they attempt to break up plays by their counterparts and upset shot attempts. In ice hockey, a penalty results in a player spending time in the penalty box. A team plays shorthanded when one or more of its players is charged with a penalty. Minor (two minutes) – called for tripping, hooking, spearing, slashing, charging, roughing, holding, elbowing or boarding. Major penalty (five minutes) – called for fighting or when minor penalties are committed with deliberate attempt to injure. Misconduct (10 minutes) – called for various forms of unsportsmanlike behavior or when a player incurs a second major penalty in a game. This is a penalty against an individual and not a team, so a substitute is permitted.